Mental Health, and a mentor for our Recovery Specialist program (peer support). She uses WRAP for herself. Keystone Community Mental Health (KCMHS) is a part of Keystone Human Services that are based out of the city of Harrisburg in central Pennsylvania. The KCMHS serves approximately 700 individuals with severe mental illness throughout Pennsylvania and Maryland in a variety of settings providing: case management, supportive living, community residential programs, partial programs, educational programs and supported work settings. As Keystone began its own journey of recovery, we began looking for a tool that would allow individuals to have a sense of choice in an individual plan for their own recovery. This journey has included the development of peer support and having nine Recovery Specialists and Supervisors who now use WRAP as a common language to communicate. In our group meetings we have shared conversations about the use of different WRAP tools from using a carved stone with sandalwood during presentations to keeping an orange in a plastic bag in the freezer so that when the disassociation begins the orange can be taken out and by focusing on the cold and the texture of the peel and then beginning to scratch at the peel and smell the scent of the orange they are able to begin focusing again. Through using an integrated peer support model throughout our services the Recovery Specialists have had opportunities to discuss WRAP and recovery-based conversation on individual and small group settings. At this program, WRAP is used for weekly discussions with their small groups. One individual from this program found WRAP a significant tool to stay with her recovery journey during hospitalization. In 1995, I experienced severe depression and could no longer hold down a job. I really didn’t care if I lived or died. I took a slight overdose to just turn off my mind and sleep. I held many part-time jobs and lost them. My path of recovery is still riddled with many ups and downs. I can handle them with the correct doses of medication and therapy. Being a Recovery Specialist is work where I meet many wonderful, intelligent people who have mental illnesses. I have come to see that I am supporting them by my home visits and working on their own Wellness Recovery Action Plan (WRAP). It is not all about the WRAP, but the socialization of talking, visiting in a relaxed and safe setting and knowing someone cares that allows individuals to open up to me. All of my people were anxious about working on the WRAP and found it overwhelming but I assured them that we would take it at their own pace. The most important aspect of the WRAP for my individuals is the Toolbox. It was hard for them to think of things to write down but as we talked about how they were feeling and where they were in their lives, it became easier. I can’t emphasis the need of talking through their feelings. In every case their WRAP Wellness Toolbox quickly filled up with many pertinent ideas using this method. We all find the Daily Maintenance List to be an essential part of each day. It is an excellent coping mechanism that, used daily, can lead to a new lifestyle. Triggers are crucial to recovery. Together we were able to think of events that occurred either daily or occasionally are harmful to their health and safety. Now they are using their Toolbox when the Triggers occur and it has been helpful to them in near crisis situations. One individual had great success with the WRAP. Together we worked on it for three months. She was surprised by the inner strength she developed using the WRAP. She no longer feels depressed and withdrawn, she has developed a new friendship, she gets out of her apartment and goes to the social hall. She realized that she could use her family as a support system and still remain independent and take things one day at a time. I am still working with my WRAP and find the Toolbox to be very helpful. I am more aware of the triggers that lead to extreme anxiety and depression. I can function, even on the bad days, because of my WRAP in my work. There is comfort in knowing that there are millions of people suffering from mental illness and through the WRAP, medications, and therapy, recovery is happens. My involvement with WRAP has been both a learning experience for me and a way to break through some of the walls that people have developed. I have introduced WRAP with the individuals I work with as a way to identify the triggers that cause hospitalizations and detox rehabilitations. I have now seen how WRAP works for each individual differently. I was trained through Drexel and my instructor was able to send me the post crisis plan and after crisis plan in Spanish. I have been fortunate to work with a person from Puerto Rico that came to the states last December. I did not think he would be interested in looking at WRAP because he needed to be hospitalized. This young man is 18 years old and had experienced significant childhood trauma. The incidents that lead to the hospitalization were a feeling of needing to brutalize his body while having a violent panic attack. He broke his hand in the process because he was so disgusted by what he saw in the mirror that he felt he needed to change it, and with force. When I first showed the papers to him, he began to cry. He told me that he wished there would have been something like this in Puerto Rico because he felt he would have been able to work through/identify when things were going to the point of self hatred for what had happened to him, that if he just would have written how he felt when he was feeling good down on paper and identified the few people who he has worked with here in the states and even at home, he would not have reconstructed his face with his fist in order to hide the pain. He is now at a group home and keeps the packet we worked on in his desk drawer. He takes it out a reads through it when he feels overwhelmed with his emotions. He uses his WRAP to open up and talk with the staff and other peers in his community. He is making strides and has enrolled in a GED program. Without the tools that WRAP allows a person to see they possess, we as recovery oriented care givers could not appreciate all the strengths that he offers to us. 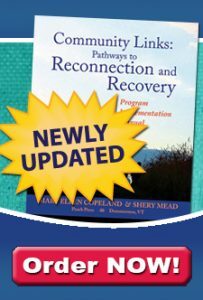 As Keystone continues to use WRAP individually and in small groups in our residential programs, Mental Health Professionals have now begun to use the Creating Wellness videos and other recovery education materials with all direct care staff to enhance there understanding of mental illness and of the peer support program.